Deluxe Desk Pad includes a refillable, black padded holder so you can reuse it for years. Planning pages range 12 months from January to December and are printed in deep blue and gray. 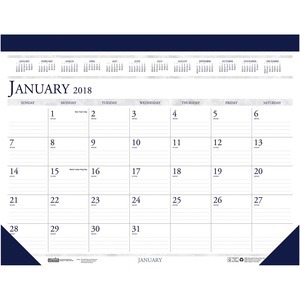 One-page-per-month format includes ruled daily blocks (3" x 2-1/8"), count of days/days remaining, Sunday-through-Saturday scheduling, and a full-year calendar reference along the top. Desk pad contains paper made with a high percentage of recycled material.